A very large impact crater causes a very large deep circular hole into the earth. This hole is unstable, and changes shape immediately afterwards. The bigger the impact, the more processes play a role in the event. At an event that causes a simple crater, the shape of the transient crater is a deep round hole. Most of it is due to compression, and another large part is because of material that is thrown out. The compression robounds, resulting in a flatter crater with a larger diameter. When the crater is larger, gravity plays a role. The rebound of the compression is not sufficient to restabalize the crater. Gravity does not allow craters to be so deep. Gravity pushes material upward from the center, thus causing a central crater uplift. Larger craters do not show a central uplift and can be more elliptical. On the moon and mars there are some clear large craters. Some of them are completely filled with lava, and are called impact basins. In the images below you can see large craters. On the bottom of the left image, you can see a large elliptical crater of mars. On the bottom of the middle image, you can see a very large crater on the moon, called the “Aitken basin“. On the left top of the right image, you can see a very large circular impact bassin. We don’t find large craters on earth. We should find large impact bassins, because the chance that the earth is hit by a meteorite is 19 times greater than the moon being hit. There should be about a hundred of them. So, why don’t we see them? Below is a possibility. With large craters on earth, crossover depth starts to play a role. When some melt occurs below 400 km depth, that melt will not go upward, but downward. This pulls the crater into a more vertical pipe. On top there would be a volcanic area, as the top part of the melt does go upward. This will become a hotspot. 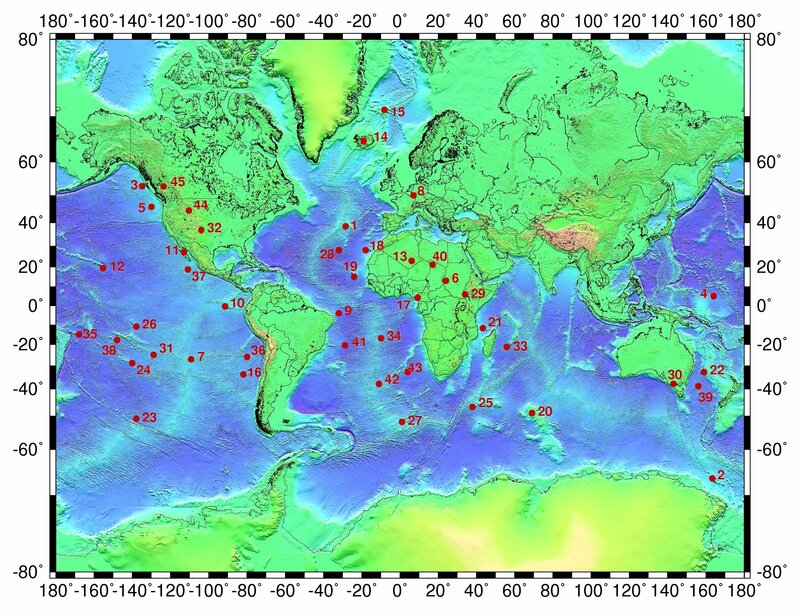 Below is a map of the earths known hotspots. When the transient crater itself is deeper than 400 km, the majority of the melt will go downward. This would cause the planet to partially implode. Gravity can no longer push the center of the crater upward. Still the crater needs to close because gravity does not allow this big hole. In stead, the crust of the planet would slide in order to close the gap. Any lava from outside would fill up the gap and when that solidifies it forms a new, thin basaltic crust. So the earths oceanic crust actually shows great similarities with the filling of our moons impact bassins. Maybe this is because they have the same cause. So actually, what is interpreted as subduction area’s, could very well be large impact craters. Within this scenario, the crust would gain speed, and that mass does not stop easily. The crust would collide and crush to form mountain areas. 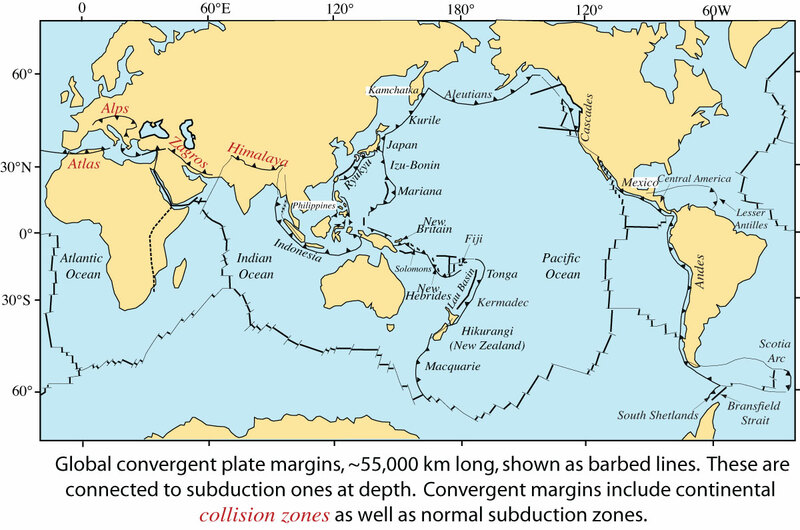 Note that continental collisions are also suggested by plate tectonics theory. However, the amount of energy within the deep time frame is not very much. For a collision, one needs speed. That speed causes kinetic energy. The formula is kinetic energy = 0.5 x mass x velocity ^ 2. With very low speed, the kenetic energy is very low. One can calculate that today India (which should have caused the Himalaya’s) has the kinetic energy of a car driving less than 20 km/h. This is because the speed of continents is so low. You cannot create a mountain by crashing a car into a continental plate. So continental collisions generating mountains would only be possible with much greater speed. Earlier, I mentioned the different sides of the planets and our moon. This could have been caused by a heavy meteor bombardment that has mostly battered one side of the planets. If that is the case, the bombardment was very short and all at once. In case of a full bombardment, craters would be overlapping. On the moon this is visible. Gravity of the earth is stronger than that of the moon. Calculations show that the crater size on earth would not differ much from a crater size on the moon. The impact is more powerful because of that gravity, but the ability to generate large craters is harder because of that same gravity. Thus the crater size is more or less the same in case of a similar impact on the moon as on earth. However, in case of a bombardment, the earth would attract more meteorites than the moon. On the moon we can see overlapping craters. On earth that would even be more the case. This makes that a full bombardment may cause a completely destroyed area in stead of distinguishable craters. This area should then be at least as big as half the planet. On earth the only candidate would be the Pacific ocean crust. That is solidified rock, covering about half the planet. The earth would change shape in that case. It would look a bit like in the illustration below (which is exaggerated) . The consequence of that shape is that the interior of the earth would bulge back to make it spherical again, and the crust would start to move. 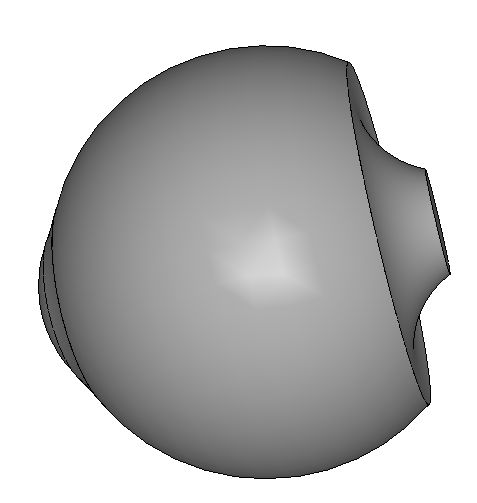 That is because gravity does not allow a shape like this: a non-spherical shape is unstable. Note: this part of the theory is not yet tested.